The U.S. Mint has released its weekly numismatic sales report, giving us our first look at numbers for the 2016 U.S. Mint Uncirculated Set and the 2016 Gerald Ford One Dollar Coin Cover. 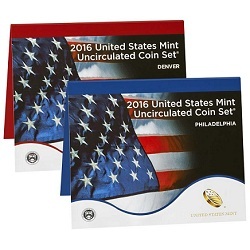 The 2016 U.S. Mint Uncirculated Set has sold 127,489 units since its debut last Wednesday, by far the highest total posted by any product during this period. Sales for the set constituted 81% of all new purchases counted on this report, but marked a decrease compared to last year’s issue, which sold 144,137 units during its first week. Second place went to last week’s other new product, the Ford One Dollar Cover Cover, which sold 10,499 units. The 2016 U.S. Mint Proof Set was close behind, grabbing third with an impressive 10,362 units sold. One again, negative corrections make up an important part of this week’s story. Those keeping tabs on the fate of the 2016 Mercury Dime Centennial Gold Coin will care to know that the item had its sales total adjusted downward by 1,396 pieces to 116,299. This is the fourth significant decrease in a row for the item, which continues to be audited as the Mint decides how best to make the remaining dimes available to collectors. The present tally leaves room for the sale of up to 8,701 more coins before reaching the 125,000-piece mintage limit. Also of interest is a surprising 8,529-set downward adjustment for the 2016 U.S. Mint Silver Proof Set, which saw its overall total drop from 196,188 to 187,659 units during this period. The following statistics show total sales for the listed items through May 22, 2016. The first numerical column includes information from the Mint’s May 15 report, the second column displays this week’s updated numbers, and the third column tallies the increase in sales over the last week. Items new to the report are listed in bold. For more information on any of these products, please visit the U.S. Mint’s online product catalog. The year is almost half over and the Silver Eagles are not even on the product schedule! They have had plenty of time to figure out and configure the dies for edge lettering. They have been doing it on the dollar coins for 9 years for crying out loud. Get your act together US Mint! @brent – The red book always has some errors in it and they try to correct on a continual basis. I would believe the latest numbers but always be wary of any of the numbers. For instance, they list mitages instead of sales for the presidential dollars and kennedy halves.